Many ways, many ways, many ways to say, I love you. There's the cooking something someone really likes to eat. In this simple song, Mister Rogers talks about a few of the things parents and children can do to show their love for each other. I sing it to myself when I am performing some of the more mundane (or challenging tasks) of parenting, and am reminded why I am doing them. You can easily substitute nearly any parenting chore - "there's the changing diapers way to say I love you", "there's the driving you to soccer practice way to say I love you", "there's the disciplining you way to say I love you", "there's the potty training way to say I love you", "there's the spending time with you way to say I love you", "there's the packing your lunch way to say I love you." 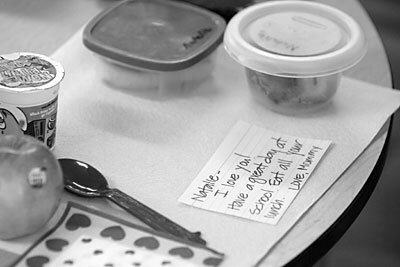 While photographing at Great Beginnings preschool last year, I was fortunate to spot the scene above, demonstrating the care with which the teachers set out the children's lunches each day and the love of the mom who packed one with a special note. Here is a link to the song, with slightly different lyrics than the CD version.